Extend the length of your XM Home Antenna cable to make getting great signal reception easy. Features: Increase your Home Antenna length. Add 50 feet to the length of the your Home Antenna cable. The extra length means you can choose where in your home or office you want to listen to your favorite programming, regardless of where the strongest Satellite Radio signal is. Easy setup: Simply place the Home Antenna where you find the strongest signal. Then use the Extension Cable to connect the Home Antenna to your Home Kit or Sound System. For use indoors or out: Weather-resistant rubber cover protects the connection to the Home Antenna. Boost your signal: An in-line signal amplifier boosts the signal strength through the length of the combined cable. Connect more than one: If an additional 50 feet is still not enough, connect up to two extensions together for approximately 125 feet of total cable (including original antenna cable length). Compatible with all XM Dock and Play, Portable, and SIRIUS XM MiRGE radio Home Kits and Sound Systems. Home Kits are included with Portable radios, sold separately with XM Dock and Play and SIRIUS XM MiRGE radios. Sound Systems sold separately. Add 50 feet to the length of the your Home Antenna cable. 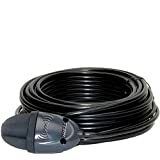 For use indoors or out: Weather-resistant rubber cover protects the connection to the Home Antenna. Compatible with all XM Dock & Play, Portable, and SIRIUS XM MiRGE¿ radio Home Kits and Sound Systems. Home Kits are included with Portable radios, sold separately with XM Dock & Play and SIRIUS XM MiRGE¿ radios. Boost your signal: An in-line signal amplifier boosts the signal strength through the length of the combined cable. Easy setup: Simply place the Home Antenna where you find the strongest signal. Then use the Extension Cable to connect the Home Antenna to your Home Kit or Sound System. Easy setup:Then use the Extension Cable to connect the Home Antenna to your Home Kit or Sound System. Increase your Home Antenna length: Add 50 feet to the length of the your Home Antenna cable.